Little Wai boy was admitted to Columbia Asia Hospital on 14 July 2013 (Sunday) at 12:05 am mainly due to high fever at 39.2C and was later discharged on 16 July 2013, Tuesday after his fever has subsided. It all started on 12 July 2013 (Friday) when Mommy was told by Wai boy's nanny that he was having fever and immediately we visited Dr. Yek for a check-up. The temperature read above 38.0C and we were advised to admit him to the hospoital if the temperature remains high after taking the medicine prescribed. And we were asked to come back the next day for a basic body check-up. After one whole night of close monitoring, Wai boy's temperature seems to have subsided but as advised, we went back to Dr. Yek for a check up on the next day as early as 9:00am. According to Dr. Yek after the check-up, everything seems to be alright but we were advised to continue monitoring on Wai boy's body temperature and if it happens to shoot up again as high as 38.0C, we must admit him to the hospital for a blood test. 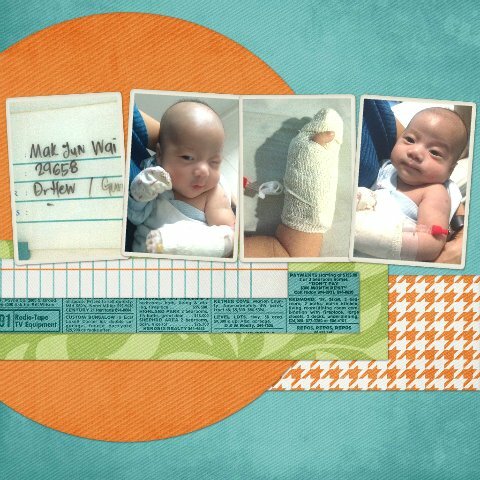 On 13 July 2013 (Saturday), Mommy and Daddy spent most of the time measuring Wai boy's body temperature and feeding him as much fluid as possible and everything seems to be under control until evening when his temperature starts fluctuating. Not to panic ourselves, we continued to monitor until about 11:00pm when the temperature hit above 38.0C. Without anymore delay, we packed and admitted him to Columbia Asia at 12:05am on 14 July 2013. After all the admission procedures and deposits paid, we were then brought to the ward to wait for the Paediatric in-charged, Dr. Hew who came about 2-3 hours later. According to Dr. Hew, Wai boy will have to go for a blood test and also urine test in order to know what is the actual caused of the high fever. Meanwhile he will also be given a course of antibiotic using the drip as he is too young to take in orally. Despite being very reluctant to have our little boy to go through all this trauma but we have no choice because that is the only way to detect the root problem of it. During the two days/nights stayed in the hospital, Wai boy was very frightening and hardly sleep. Even the milk intake has reduced. Mommy's heart breaks everytime Wai boy cries and curdled him closely all the time until Daddy came to take over. Daddy and Mommy took turn to take care of Wai boy as Daddy needs to report work due to some urgent matter while Mommy is still on maternity leave at that point in time. Partial of the blood test results were out on 15 July 2013, Monday and everything seems to be alright. Dr. Hew did mentioned that if the urine test result which is going to be ready by the next morning is equally good, Wai boy can be discharged. Finally on 16 July 2013, Tuesday morning, Dr. Hew came during his ward rounding and confirmed that the urine test result was equally good with no infection. Hence, we were allowed to be discharged on the same day. After this incident, we became even more careful when comes to taking care of this little baby.